With a cool initial premise, this movie starts out as interesting but becomes a little too simple as it strives to be artistic instead of compelling. A good cast and fine dialogue aren’t enough when there is a plot that barely moves during the course of the film. This is the kind of movie that could have been told in thirty minutes, and was probably written first as a short. How else to explain that the film starts out with a robbery and then becomes about finding the two guys who did it and nothing else? How else to explain that there are no elaborate chase scenes or plot twists of any kind?. The ideas do hold your attention and the artistic presence is there, but the movie makes no effort to be unpredictable and that becomes a problem. Killing Them Softly is a very thin movie. It is certainly well made and shows talent, although not the kind of talent of a good storyteller. This is more like that of an artist who knows how to show things from interesting angles, but not how to keep us interested or curious. Basically, the movie is very simple and generic. The very initial premise is fine, but the movie doesn’t go very far after that. At the start of the movie, we are with two guys working out a plan. These guys are Frankie and Johnny. Frankie is the low level punk kid and Johnny is the older man who has worked the whole thing out. It will be Frankie and his partner Russell who pull the job off. The plan, according to Johnny (played by Vincent Curatola, better known as Johnny sac from the sopranos), is to rob a card game. This is a high stakes game with dangerous people involved, and there’s only one reason why they think they might actually be able to pull it off. A few years earlier, the guy who is hosting the game, Markie Trottman, (Ray Liota), hosted another card game, and that one got robbed. Trottman was the guy who hired the gunmen and collected the stolen money. Many years down the line, after that, he was sitting around with a bunch of friends getting drunk and admitted that it was he. These guys didn’t care much, as Trottman knew they wouldn’t, since it wasn’t their money, and so everything went on as usual. But these new robbers plan to use that story to their advantage. Since the last time Trottman hosted a card game, it got robbed, and it turned out to be Trottman, himself, behind the whole thing, if this new card game gets robbed, people are going to assume it’s Trottman again. That’s the plan. And so these guys go through with it and we see the robbery. They get away with the money, and now suddenly the focus of whom the main characters are changes. Instead of staying with the robbers, who have been our protagonists throughout the movie, the story now changes to the hit man who is hired to find them. This is Jackie, played by Brad Pitt. He meets with a middle man (the always terrific Richard Jenkins), and gets the mission as it has been issued from the boss higher up. Jackie sets out to find his men. The rest of the movie becomes about him going after them. That would be fine if there were some elaborate situations here that really took time, but instead, this movie does things much differently. There aren’t any big tricks or surprises. The robber who was more of a junkie, Russell, ends up telling his whole plan to someone who then tells it to Jackie. So now Jackie knows about both Russell and Frankie. The police pick up Russell at an airport, but Jackie is able to get to Frankie. From there it becomes about taking out the two targets that are still alive. This movie is so simple and straight to the point that whole characters have to be invented and thrown in, just to do absolutely nothing at all other than help kill some time. 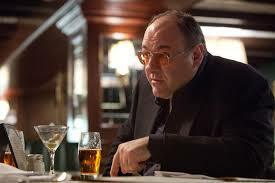 I’m talking about the James Gadolfini character, Mickey, an aging hit man who is heavy into both booze and prostitutes. Jackie goes to meet him at a bar, and while the dialogue is somewhat witty, it has nothing to do with the plot. Neither does the scene where Jackie shows up at Mickey’s hotel room to find him ending a session with a prostitute. A major problem with this movie is that it doesn’t care about being predictable. If a movie starts out with a plan and announces it from the beginning and then everything that happens in the movie goes exactly as they planned it, than the movie is boring. People like surprises. This movie doesn’t seem to get that. Still, it is far better than this director’s previous film, The Assassination Of Jessie James By The Coward Robert ford. That movie was slow to the point of being unwatchable. This one is fast moving and well made; it’s just not very original or creative. On top of that, the violence is handled pretty poorly. It is all super realistic, to the point where you see everything and hear every little sound. The result is pretty gross. When Markie Trottman gets worked over by two guys who Jackie hired, the beating scene is pretty brutal. There is nothing quick or glamorous about this at all. The same can be said for the car accident scene that happens later on. These scenes go to slow motion and show things floating through the air as if this was the matrix, and clearly it is trying to be artistic, but the result is just upsetting instead of fun. For everything that this movie does wrong, it’s not really all that bad. While the plot isn’t especially fresh, it does start out with a pretty clever idea about framing the robbed card game on the guy who did it once bedsore. The conversations are pretty quick and well written, and top-class actors deliver them all. Whether it’s brad Pitt sitting in a car talking with Richard Jenkins, or Pitt sitting in a lounge with gadolinium, these people are fun to watch. The cast of this film is terrific and that goes a long way. It’s not a good movie, but it does have its redeeming merits.